Expect to dine well in Jordan. Food is very much part of Jordanian culture, with serving it often seen as a demonstration of hospitality in a country where hospitality is seen as all-important. When dining, visitors may first find themselves having varied appetizers called mezzeh, which can often be a meal in themselves. Mezzeh is often accompanied with bread. 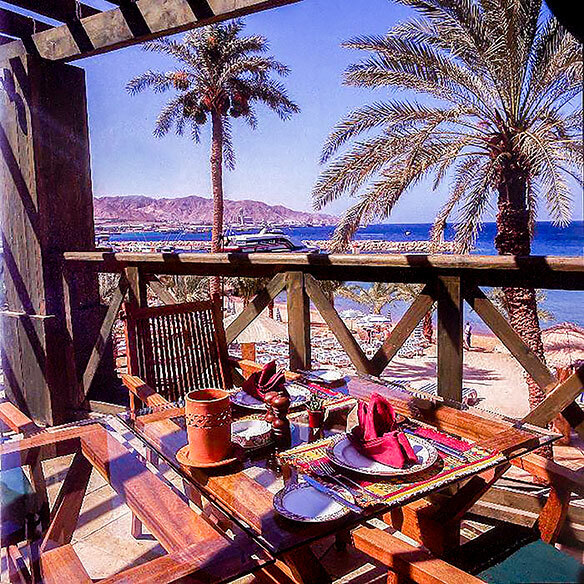 Tourists can also sample such famed and delicious choices as hummus, a puree made from chick peas; baba ghanoush, a dip of which eggplant is the main ingredient; and tabouleh, salad made from chopped parsley, mint, tomato, onion, bulgar wheat, and lemon juice. Among popular main dishes are kebabs, which are cooked over charcoal. Jordan’s national dish is mansaf, a Bedouin creation that sees lamb served on a bed of rice and pine nuts in a tangy yogurt sauce. Jordanians appreciate sweet items as well, among them baklawa, phyllo pastry that has chopped nuts in a honey syrup. Konafa is shredded dough-filled nuts and goat cheese that’s baked in syrup. Tourists can also try the food in street stalls that serve the likes of falafel, popular throughout the Mideast. Jordanian officials also note that Jordan has long been producing wine, with some scholars believing the wine served to Jesus during the Last Supper was from northern Jordan. Jordan has wineries that use Jordanian grapes, and some of those wineries produce organic wines. Most Jordanian restaurants serve alcohol, and bars are also found in cities. Alcohol can also be bought in supermarkets and some stores. Jordanians also like to drink strong coffee, with coffee being a symbol of hospitality. Tea in Jordan tends to be served in small glasses and is generally sweet.